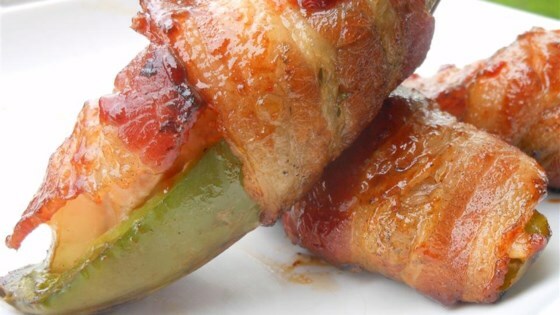 "I never really cared for the cream cheese versions of stuffed jalapeno peppers, so I came up with my own. It takes a little prep work, but they are so worth it! Serve with ranch dressing for dipping." I think if you leave the cream cheese in there it would be fantastic!! Lots of flavor exploding! I have made these for years and they always are a huge hit with both family and friends. They are time consuming to make but 100% wort every minute!!! Made them for a garage football party and they were a big hit . I added garlic and teriyaki sauce to the chicken then put in frying pan to crispy up the bacon. Made them with more seasoning; a VERY finely minced Tai chili mixed with garlic powder and salt. Dredged chicken pieces in that mixture and proceeded with the rest of the recipe.